I am thinking about all the Mother's I know and love. Who have done so much for me and all their loved ones. My own Mother who has passed on. She was a wonderful woman, gentle and mild, and self-sacrificing. She had rheumatoid arthritis at a young age, yet she would walk with me for miles in the coldest winter snow to take me to Ballet class or Girl Scouts, or shopping, as she didn't drive. We would read together every night. She would read a page then I would read a page. She would stay by my bedside until I went to sleep. I couldn't sleep very well then as well as now. It was so comforting to have her nearby when I am sure she must have been very tired. Now with many children of my own I understand what a Mother truly is..... . Please feel free to leave a comment. If you click on the photo it will enlarge for a closer look. Thanks. The tablecloth was from Tai Pan Trading. Purchased last year. I had to buy 2. They were very reasonably priced. Only sold in a rectangular size and I wanted a round cloth. So between the 2 I made a round. I used the left over fabric to make napkins, which I added a shell stitch crocheted border. I love decorative edges on napkins. The woven balls in my tablescape came from Tai Pan trading. They were a natural color. 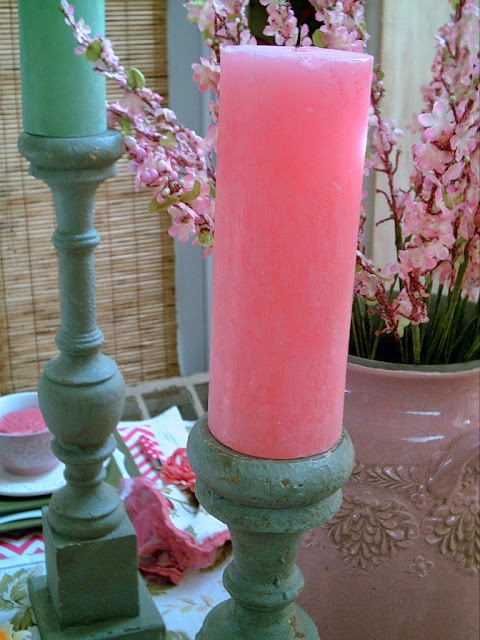 I used 3 different colors of spray paint, light ballet pink, watermelon, and sage then I sprayed the balls with the paint to scatter on the table. The pink and white Chevron design place mat on top of the white linen place mat is wrapping paper. I just cut the paper to the size I wanted. I used my green Crown teacups, which was a close enough match to place at each place setting. 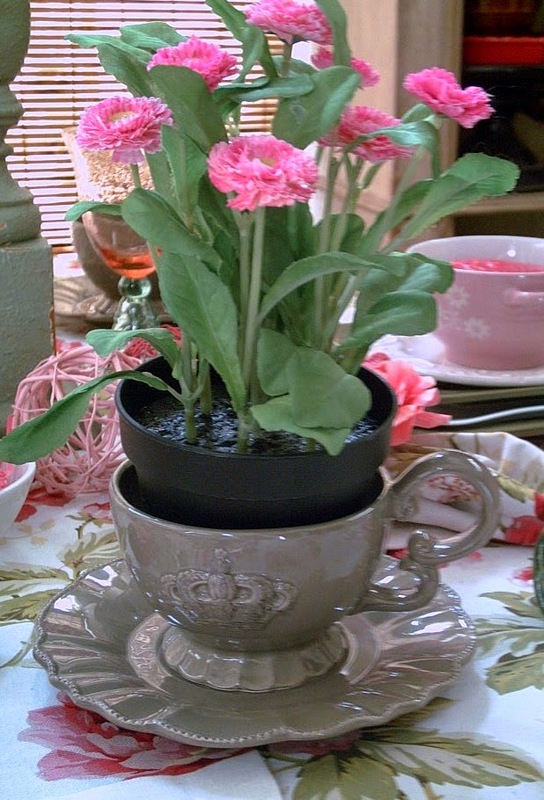 I just set the faux flowers in for the photo. I don't know if you can see but the pink bowls at the top of my plate stack have adorable white flowers both painted and embossed onto two sides of the bowl. My pink Urn came from Thanksgiving Point Emporium. I really searched to find a pink one for a long time. This urn had been sitting behind the cash register for some time. It had been staring me in the face and I had never noticed. 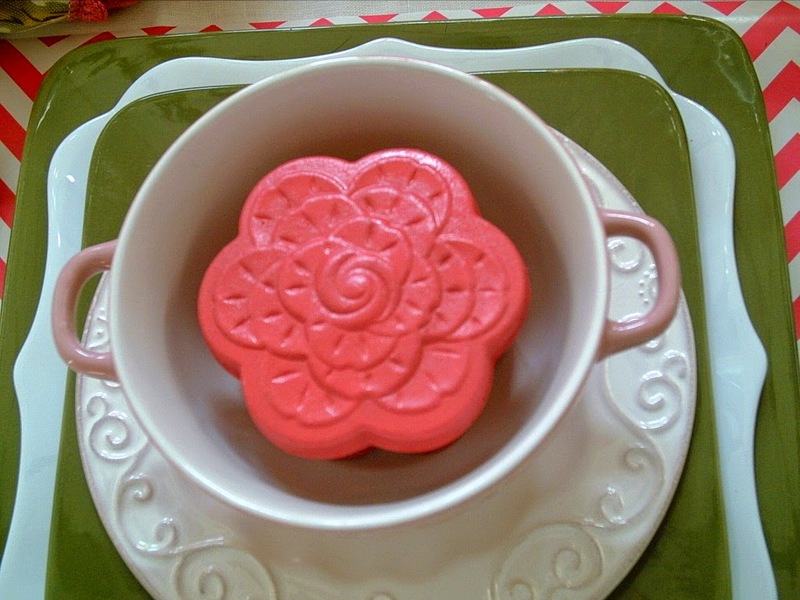 The little rose box is from Martha Stewart. They are molded cardboard and I just spray painted them with the Watermelon colored paint. They have a surprise in them for the guest! I will be posting this on Between Naps on the Porch Tablescape Thursday. 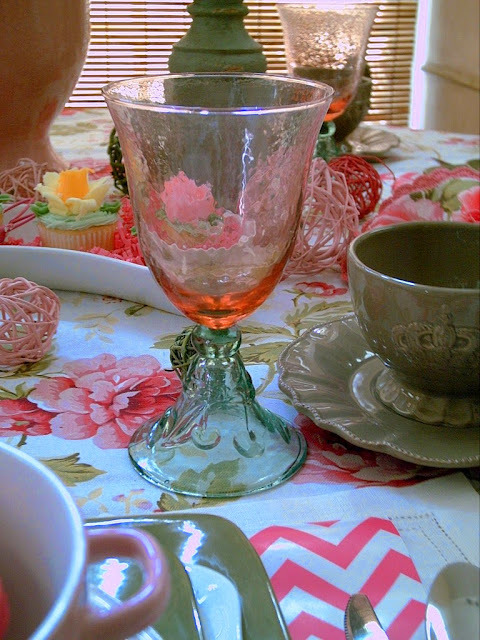 Items used in this tablescape are from a myriad of places. Tai Pan Trading. Pfaltzgraf. Thanksgiving Point Emporium. Williams Sonoma Outlet, are most of the sources. Valerie, a lot of work went into this beautiful tablescape, and it truly paid off! It's gorgeous. I love the handmade and DIY elements, wonderful. Your mother sounds lovely. Also, don't you just love Tai Pan? It's one of my favorite haunts! 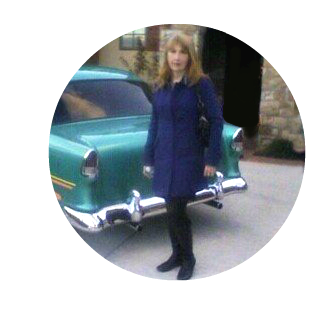 I hope to be sharing a tour soon....thank you for sharing! This is such a lovely, girly, springtime table. 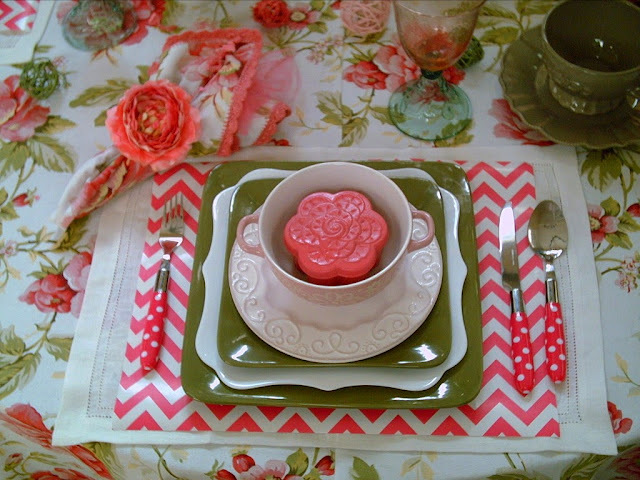 Such a pretty combination of colors, and I do love those square plates. My mother passed away two years ago February. No holidays have been the same since then and this year, like last, I'll just grit my teeth and do my best to get through Mother's Day as painlessly as possible. Lovely! The colours and dishware look wonderful the way you've set everything out. 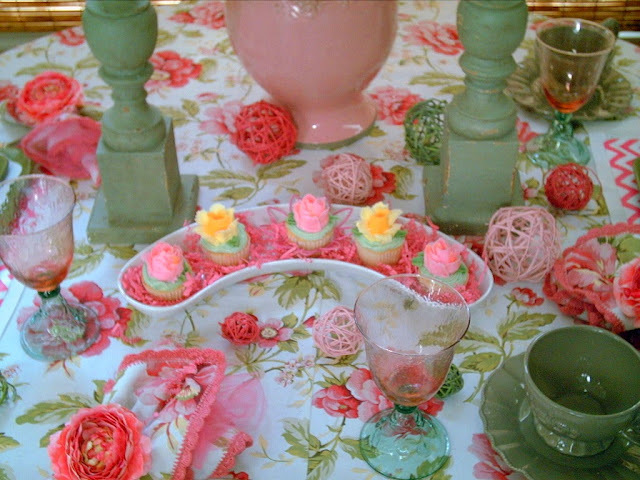 I think my fave thing though are the floral napkin rings - must find some of those! It's always touching to hear of someone who has fond memories of their mom and I enjoyed hearing about yours. Valerie, this table is fabulous! I love the soft colors and your accents. 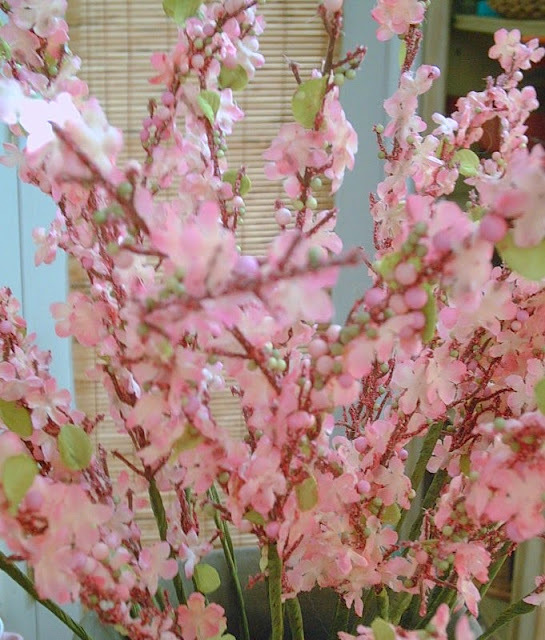 Pink and green look lovely together. The added touches on the napkins is so pretty. Your Mother would have loved this table setting. I have something to show you, however I don't see anywhere to contact you. Valerie your table for Mother's Day is stunning! 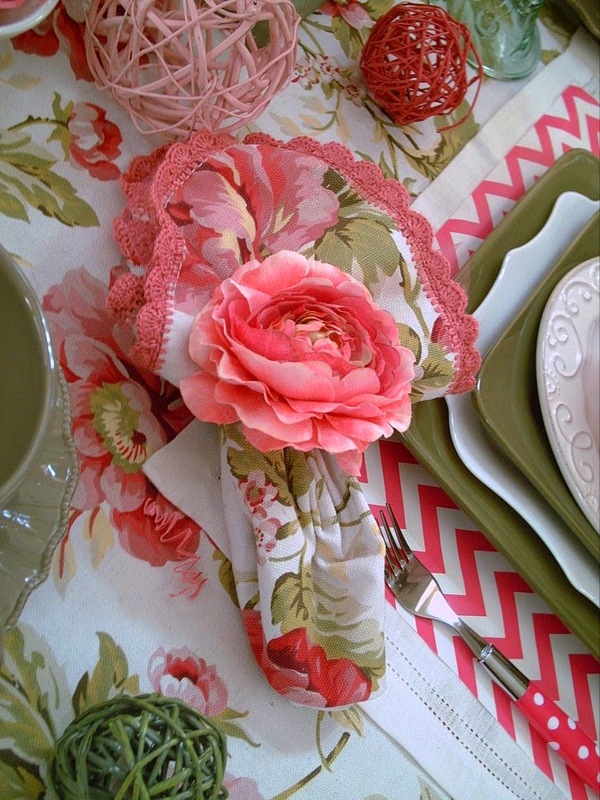 Such feminine accents with lovely china and the napking rings, napkins and table topper are simply perfect. I love the description of your mother at the beginning. Happy Mother's day to you! What a lovely table setting. So pretty!! 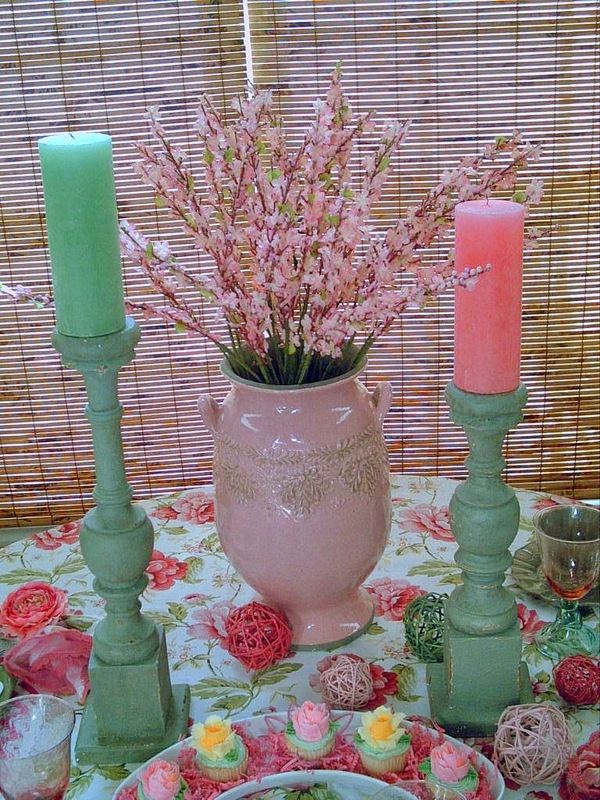 Pink and green is one of my favorite color combinations!! The stepping stones you asked about were my neighbor's and she bought them many years ago . Maybe from Lowes. This is such a lovely table, Valerie. How clever to cut the wrapping paper to put on top of the place mats. I love the rose napkin rings, and since I also like pretty borders on napkins, I really like the way you made the napkins. Did you make those gorgeous cupcakes? They are incredible. I also enjoyed your reminiscing about your Mother. She sounds like a wonderful person. Beautiful table! Love all of the color and detail. What a lovely tribute table for Mother's Day. I'm so impressed that you made the two tablecloths into one and then crocheted the edges of the napkins you made. You're mother would be so proud to see your skills used so well. Love the cute cupcakes in the curved dish. 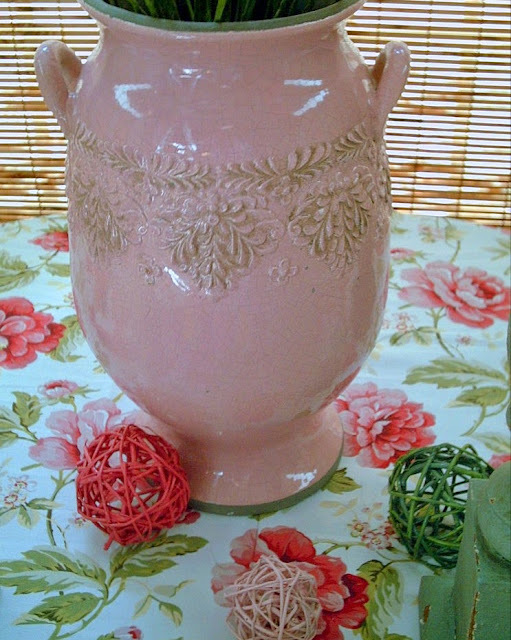 That pink urn is great- that can be used for a lot! Beautiful tablescape! Just dropped by to say Hello and to my surprise a table decorated in my favorite colors! The linens are so pretty. You put alot of work into this table! It is just stunning! Wow Valerie, it's all soooooo pretty! How clever to make a round cloth out of 2 rectangles, and use the scraps for napkins, and then to crochet the edges! I am beyond impressed! 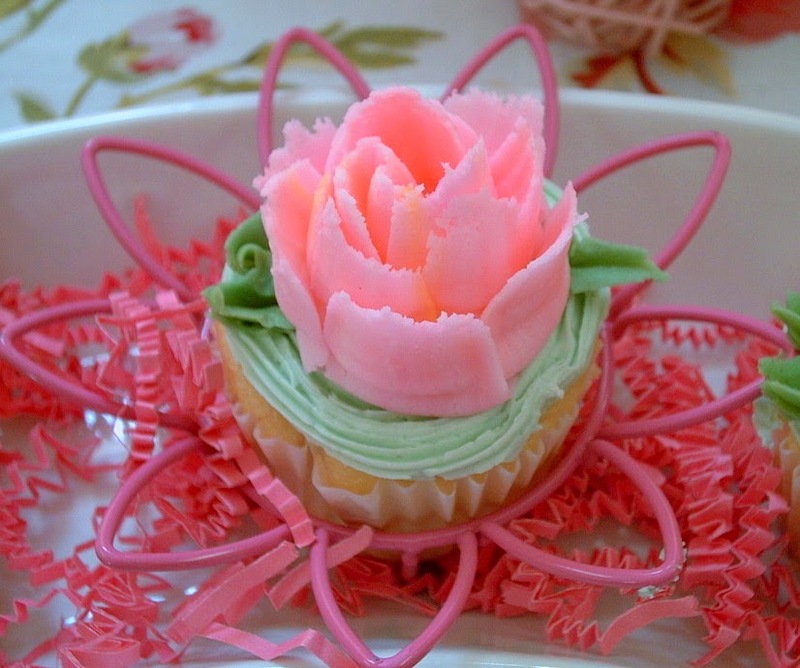 Please tell me you didn't make those gorgeous cupcakes too~ all your pink and green pretties are so perfect for mothers day! 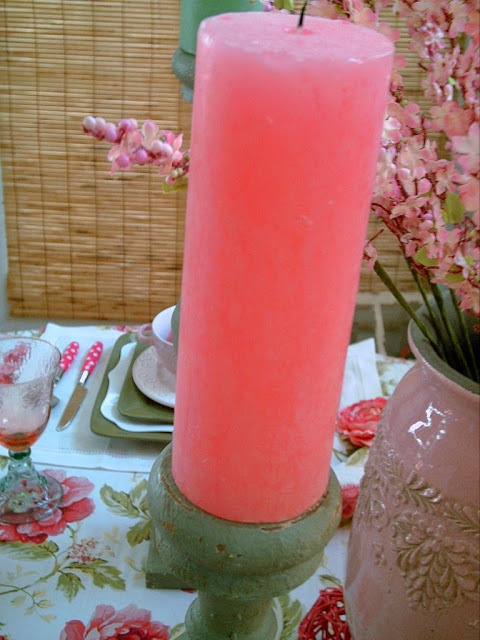 Your tablescape is just darling! I am in love with your dishes and stemware. I am going to have to go on the hunt for those pieces!! Such a gorgeous tablescape Valerie. Those colors are so pretty. 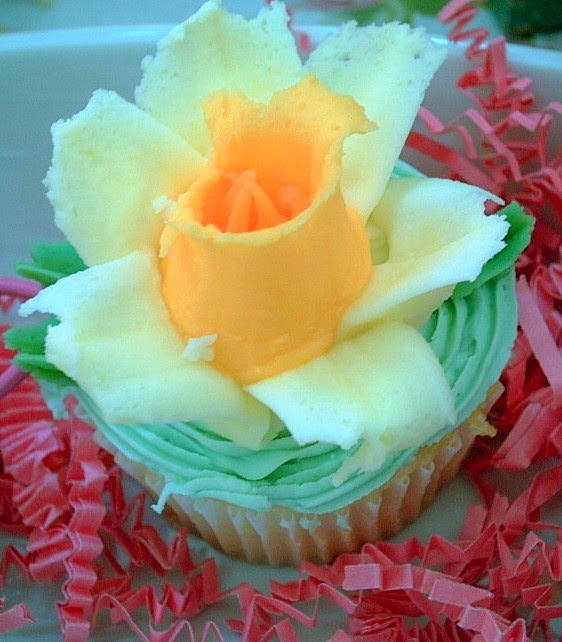 You even topped it off with cupcakes...Yumm! Thanks for sharing at DI&DI. Hello Valerie, your Mother's Day tablescape looks wonderful! So many thoughtful and pretty details. Visiting from Dishing It & Digging It. Have a lovely day! I love this warm color palette and all of the feminine touches. 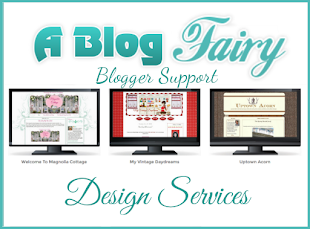 I've heard of Tai Pan Trading but we don't have one nearby and that's probably a good thing! The sweet treats you added were the perfect touch and thanks for sharing the story about your mom. Have a beautiful and creative week! Oh, your table is gorgeous! I love every detail. The water goblets are SO pretty! The cupcakes look delicious!! I am so glad you got your urn too!!! Lovely table. That watermelon color is so great! Did you hear that the Emporium is gone? Sad, sad, sad! I loved that store! My mother has been gone for 26 years now! I always still think of her, how she would love this or that. She would have loved all of the goodies at Tai Pan, and she would have been a blogger, for sure!